This album released on December 7, 1999, only a few days before the beginning of the new millennium. The songs on this album in particular seem to heavily lean towards the “new” style of popular music that seemingly overtook the early part of the ’00s, only having a few songs that call back to the heart of the ’90s. This change seems to note that the “NOW” albums are keeping up with the times rather than simply grabbing at whatever songs they hear on the radio. In contrast to the previous two albums, I remember hearing several of these songs on the radio as a kid, so I have a larger pool of opinions to draw from here. Let’s start from the beginning. 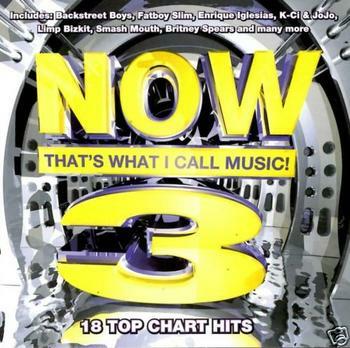 “NOW 3” opens with “All Star” by Smash Mouth, a truly classic song. This upbeat song features a message of positivity and change that is really hard to ignore. The tune exudes the essence of a summer block-party and spiked, frosted-tipped hair. I can remember listening to this song whenever I could catch it on the radio. While back then I could listen to it on repeat, now the song seems a little grating – like it was trying to be a party anthem. It’s not bad enough to make me want to throw bread or anything, but it’s definitely in the “use sparingly” category. Another song I remember from being a kid was “All I Have to Give” by Backstreet Boys. This slow-paced ballad got a lot of airplay and – I have to admit – as a kid, I enjoyed it. Listening back on it now, it just seems like a shallow, generic tune and I must’ve been suffering from some kind of adolescent Stockholm Syndrome due to forced radio exposure. It’s boring, to say the least, but it does mark the third appearance in a row for the Backstreet Boys in this album series. “Hey Leonardo (She Likes Me For Me)” by Blessid Union of Souls was another song I’d heard and enjoyed as a kid. I can remember wishing for some recorded version of it to play on a whim, but I could never catch who sang it or what it was called. 16 years later, I have my answer and I still want it on my iPod. While I’d heard this song and the one before it, there were a few on the album I didn’t get a chance to hear as a kid. Some of the songs that were new to me on this album, I found surprisingly appealing. In particular, “If I Could Turn Back the Hands of Time” by R. Kelly features a ’50s doo-wop inspiration and is really listenable. I seriously doubt I would’ve enjoyed it as a kid, but as an adult, I’m not reluctant to admit that I enjoyed it. R. Kelly’s smoother, slower sound makes a great palate cleanser after the ear-destroying duo of “Nookie” by Limp Bizkit and “Special” by Garbage. The slow jam seems to be a recurring theme on this particular album. Returning artists to the “NOW” series are Britney Spears with “Sometimes,” K-Ci & JoJo with “Tell Me It’s Real,” and 98 Degrees with “The Hardest Thing.” Each of these songs are slow, R&B inspired tunes with a focus on love – either finding it, being in it, or ditching it. While that’s not a bad theme to have, the amount of love songs seems odd next to faster (but no less enjoyable) punk-like songs such as “What’s My Age Again?” by blink-182. This album does, however, have a lack of truly oddball songs. Even the songs that I’d consider “out of place” are extremely catchy. Both “The Rockafella Skank” by Fatboy Slim with its repetitive but danceable beats, and the well-paced, Spanish-infused “Bailamos” by Enrique Iglesias are pleasant listens on this particular album. Truly this album is a standout over “NOW 2.” I found myself enjoying more of the songs on “NOW 3” and definitely being more willing to add them to my music library. With only a couple of what I’d consider really poor songs (the tracks from Limp Bizkit and Garbage), I think they really picked a fine selection of songs to be featured. “NOW 3” might not be as good as the first iteration, but it definitely recovers from the weak second entry. I wanted to draft you that tiny word in order to say thank you over again just for the goouergs knowledge you have shared above. It’s so generous of you to allow without restraint precisely what a few people could possibly have supplied for an ebook to earn some cash on their own, most importantly considering the fact that you could have done it if you ever desired. These basics as well served to provide a easy way to comprehend other people have the same passion much like my own to know the truth a lot more on the subject of this problem. Certainly there are a lot more fun occasions ahead for individuals who read carefully your blog post. 08/02/2009SapphireIt is wonderful to get everything pulled together in one place – there is so much happening on Jokaydia it is very hard to keep track of – I do not know how you have done it all Jokay! !